Providing one stop fabrication service to manufacturers throughout the process industries, Ross, a world leader in mixing and blending technology, designs and builds storage tanks, pressure vessels and reactors for virtually any process or application. Complimenting a wide array of specialty equipment for mixing, blending, drying and dispersion, Ross’ fabrication capabilities enable companies to standardize on quality, simplify procurement, streamline costs and benefit from decades of engineering experience. 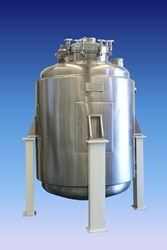 Pictured is a 300-gallon holding tank designed for 75 psig internal pressure at 350ºF and also rated for full vacuum. Equipped with a 50-psig baffled and insulated jacket, the tank is built to ASME Code Section VIII Division 1 and registered with the National Board of Boiler and Pressure Vessel Inspectors. The stainless steel type 316L wetted parts are polished to 180 grit finish with all internal welds ground smooth and flush. Product is discharged through a pneumatic ball valve with tri-clamp outlet and fail-safe spring return actuator. Passivated with 20% nitric acid solution, this tank also includes four internal baffles, a thermowell and various size nozzles on the top head.